Okay, deep breaths all around. Are you ready for another one of those retro reviews in which I regale you with nostalgic views of my childhood reading and rhapsodize on another heroine who contributed to making me who I am today? If you're not (and I totally would not blame you in the slightest--I know how I can go on about these things), you should probably just swish on by, cause Alanna is sort of the mother of them all when it comes to characters who own a little piece of my soul. She's right smack dab there in the company of Harry, Aerin, Meg, and Dicey. As I think about those girls and the effect they initially had (and continue to have) on me, I'm back in that familiar circle of awe. What would I do without them? Alanna got me through being 13, and years later I think about her on a regular basis. I realize so much of your connection to characters and their stories has to do with the age at which you as reader make their acquaintance. And, truthfully, I'm not at all offended if you come to the Song of the Lioness quartet later in life and don't find yourself as fully bowled over as I was (though I will likely nudge you in the direction of finishing the series just to see because they're short, what can it hurt, plus the characters grow up, the books get better and better, and really no one should miss that ending . . . ). But all fangirling aside, I will say that it is impossible to overstate how hard I fell for this series and that imagining my life without them is not only distasteful but unfathomable. Faced with being unwillingly separated and sent away to the palace and the convent respectively, twins Thom and Alanna of Trebond take matters into their own hands. Born out of Alanna's determination, the twins decide to switch places. Thom will go to the convent to train as a sorcerer. Alanna will masquerade as Thom's twin "Alan" and train to be a knight. When she's won her shield and proved her worth to king and court, she will reveal her true self and make her way as a knight-errant in search of adventure. It all seems so easy initially. But, of course, the unusual course she chooses reaches into every aspect of Alanna's life and alters it. Because, her obvious deception aside, she has also been gifted with certain abilities that she fears, abilities that could ruin her chances at the life she wants if they come to light at an inopportune moment. It is therefore with a certain reluctance that Alanna makes friends among her fellow pages at the palace and the denizens of the capital city of Corus. Going it alone feels like the safest course. 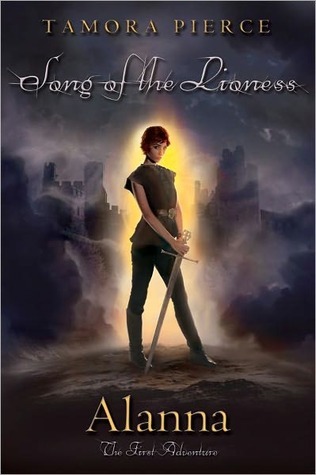 But Alanna soon learns that she will need what friendships she can cobble together if she is to embrace all of who she is and survive the swirling danger lurking in the bowels of the castle. The boy hit the wall. "I don't want to be a knight! I want to be a great sorcerer! I want to slay demons and walk with the gods--"
That first page still makes my stomach all jumpy. And basically those of you who love girls in disguise tales can sign up here. Alanna was one of my very first experiences with such a story line, and the danger and audacity and excitement got to me something fierce. She captured my loyalty and affection in one fell swoop. Because she knew what she wanted, and she was going to get it if it killed her. But along with that dedication and, yes, ruthlessness, came incredible loyalty, the voracious desire to learn, and a great capacity for love and friendship. Far from perfect, however, Alanna screws up. Royally. She says the wrong thing, she stumbles over her doubts and fears, and she occasionally doesn't see what's right before her eyes. But she's so vibrant and hell bent on being the first female knight in more than a century, and she always, always owns up to her mistakes and rectifies them. Happily, she is surrounded by a killer cast of mischievous pages, loyal retainers, wise women, gallant knights, dubious dukes, one noble prince, one arch nemesis, and one steal-your-heart-and-never-return it thief. And it's these secondary characters who provide such wonderful fodder and foils for our would-be knight. Because of them, the humor and the grand coexist in top-notch harmony. Returning to Tortall is like returning home. And Alanna? She still feels so real to me, it's as though I could reach out and grab her arm. When she grimly deals with her changing body, I feel her frustration. When she awakes from countless nightmares of the obstacles and responsibilities awaiting her, I gulp along with her and wipe the sweat off my brow. And nothing, but nothing, will keep me from reading her story to my daughter when she's old enough. Because Alanna is one of those girls she will need to know. Who will remind her that it's okay to be different, it's okay to rail and rage at life, that she can hold in her hands the dreams closest to her heart, that she is strong, too. I loved these books as a kid! Your review tells me it's been way too long since I've re-read this and will have to rectify that immediately! Did you ever read Trickster's Choice or Trickster's Queen? 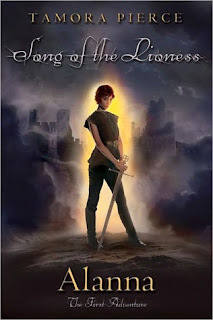 I never have although I've read a few of her other books based in Tortall but none really came close to the love of the Alanna books for me. Misti, I did read the Trickster books. I was so excited to read about Alanna's daughter, and I enjoyed Aly's story a lot. Nawat was a great character as well. Nice to have glimpses of Alanna and Co, but I really missed having them center stage. I loved the Kel and Daine books and have a hard time picking between them for my fave after Alanna. I'm a little bit of love with Tamora Pierce and really need to get around to reading these. Gah. Nicole, oh my word. YES. Yes, you do. I love the Song of the Lioness so, so much. 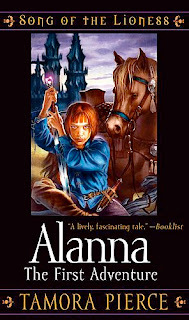 My favorite Tamora Pierce series is a ties between Circle of Magic and Protector of the Small, but Alanna's story is up there. It definitely influenced my love of girls in disguise. I think the craziest thing is that I used to be meh on The Woman Who Rides Like a Man. Now it's probably my favorite in the quartet. Livi, I do love Kel and her story. I always wanted a bit more from the ending. It was hard to say goodbye and let them go. I only ever read the first one of these after a college roommate suggested it. But, I LOVED it. I might have to finish the rest of the series. Emily, oh wow. You must reapply yourself to the series. They each get better and better. Melissa, I highly recommend the last two. I want to hand them to every 13-year-old girl I know . . .
Oh oh, I would like to sign up for the girls in disguise please! I've been wanting to read this ever since I first saw you talking about it. 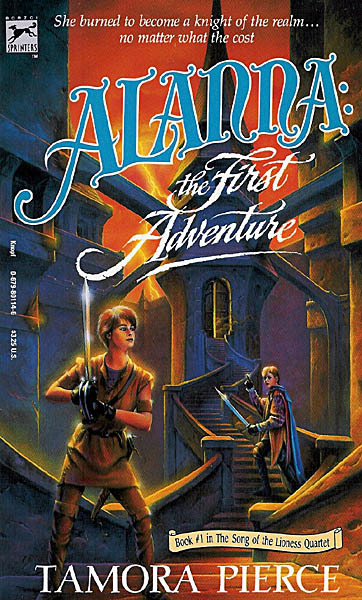 I realize it might not click quite the same now as it might have if I'd read it when I was younger, but I still want to read it so badly! Heidi, I have your name down. Just grab all four and down them with some ice cream or a nice brownie. 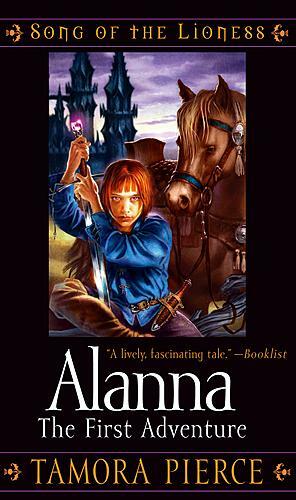 I think current YA heroines owe so much to Alanna. Oh for crying out loud I have to read me some Tamora Pierce...(I hate the feeling that I will never be able to catch up with all the books I missed when they were first published). Charlotte, WHAT. You have not read these books? I'm . . . at a loss. They are simply splendid and we must discuss them when you do get around to them. Definitely start here with Pierce, btw. I am so grateful to my friend who lent me this whole series (as well as the Immortal Quartet and Protector of the Small books...she also introduced me to Terry Pratchett so basically she has awesome reading taste!) I was 13/14 and completely enchanted-I think this was my first experience with the girl disguised as boy plotline as well and everything felt so fresh and exciting. I hope your review prompts people to pick this series up soon! I met Tamora Pierce in November at a book signing! It was awesome. I was pretty much freaking out on the inside while trying to stay cool on the outside. I'm not sure I actually succeeded, especially because Diana Peterfreund was there too and right behind me in line. Basically it was the best day. I've only read the first in this series, my library system never seems to have a copy of the second book. I'm one of "those" people, I won't skip to book 3 (which they have several copies of...). Kylee, oh my word, you should absolutely NOT skip to book 3. There are some very important bits in book 2! Please let me know when you do get around to the other 3! I have something to admit... I have never read Tamora Pierce. I know, I know. All of my friends haven been saying that I must! I'm not sure why I haven't. I guess I always thought they would feel "too young" or something? But your review has me thinking there's more to it than I expected. Kay, okay. It's okay. It's gonna be okay. Oh wow. I didn't realize you hadn't reviewed this one before -- love everything you said. That first page is truly wonderful. Thank you again for introducing me to her story, I'm so happy I stumbled upon Alanna. How I wish I had read her when I was 13 though! Michelle, I know! Silly of me. And, yeah. She's sort of a slam dunk for 13-year-old girls. We would love to republish your blog's RSS Feed in our new Books section. Every post would have a description of your site and a link back to it. Our visitors would love to read your content and find out more about you! You could also publish excerpts of your books if you'd like :), along with links back to pages where they are for sale. It's a great opportunity to spread the word about your work and reach new readers. We don't censor or edit work. We will be featuring and promoting content and book excerpts across the web. I never read these until a year or two ago and I LOVED them! Yes, I probably would have loved them even more as a kid but they still got to me as an adult. I've since also read The Immortals series and I'll probably read everything she's ever written eventually. Loved seeing this up today! Catie, that makes me incredibly happy. The books have aged well, I think. I do love the Immortals, too. Daine and Numair are awesome. And I have a very soft spot in my heart for Kel, too. While I didn't love Alanna's series, I still enjoyed reading it. I agree with what you said, it really depends on when you discover these books. I have a feeling I would have the same reaction you did if I found out about Alanna when I was in my early teens. I did love the series about her daughter though. And I keep meaning to read the rest of Tamora Pierce's books but the TBR pile isn't letting me. Chachic, it does. 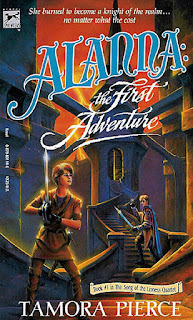 Those books you read as an early teen. Man, they can come to define you for years to come. If you loved the Aly books, you might give the Immortals a try at some point. Daine has a certain gravity to her you might like. Misty, you kindred spirit you! What a wonderful way to put it. That is exactly what happened to me as well.